Freshman Jen Tamindzija (Malden, MA) and sophomore Arielle Cooper (Mystic) hit late home runs to help carry the Eastern Connecticut State University softball team back from a three-run deficit after five innings and to a 6-5, eight-inning victory over the University of Southern Maine. With the come-from-behind victory, the Warriors secured a sweep of the Huskies in a Little East Conference doubleheader Sunday at the University of Connecticut softball field. In the first game, junior All-America Molly Rathbun (Hebron) pitched a one-hitter, drove in two runs and scored two runs in Eastern’s 8-0, five-inning victory. The pair of wins extends the Warriors win streak to eight and improves their record to 15-3 overall and 4-0 in the Little East. The Huskies remain winless in the conference at 0-4 and fall to 2-22 on the season. Trailing 5-2 in the nightcap, Eastern scored twice in the sixth on a sacrifice fly by freshman centerfielder Courtney Jobin (Oxford, MA) and Tamindzija’s pinch home run, tied the game in the seventh on Cooper’s one-out solo home run, and won its eighth straight game in the eighth when sophomore infielder Kelly Paterson (Southington) raced home from second on an infield ground ball by sophomore leftfielder Danielle Bourne (Branford). The homer was the first in the career of Tamindzija. Freshman Samantha Morse (South China, ME) had handcuffed Eastern in the second game on four hits through the first five innings and Southern Maine (2-22, 0-4 little east) scored twice in the first, twice in the fourth and once in the fifth off sophomore starter Christine Akcer (Milford) to move out to its 5-2 lead. Sophomore second baseman Anna Allard’s (Parsonsfield, ME) leadoff double in the fifth – one of five doubles in the game by Southern Maine -- knocked out Acker, but Rathbun kept the game close by striking out eight over the final four inning in place of Akcer and keeping the deficit at three runs. 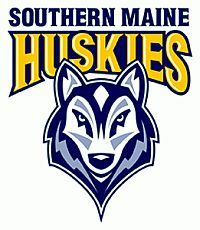 Allard had four hits and scored two runs for Southern Maine in the second game, with senior leftfielder Sarah Deroche (Portland, ME) driving in a run with a single and scoring in the first inning, Morse doubling in a run and scoring and No. 9 hitter Stefanie Stockwell (Buxton, ME) singling in a run in the fourth. Cooper’s struck her game-tying home run in the seventh – her third of the year – on a 1-2 pitch. Eastern won the game in the eighth when Paterson reached on an infield error, moved to second on a wild pitch, and scored when neither Morse nor her left-side infielders could make a play on Bourne’s squibbler to the left side. In the opener, Rathbun (8-0) allowed only two baserunners while fanning eight. Rathbun struck out the first five batters before walking senior catcher Melissa Caiazzo (Portland,ME) to lead off the third. Deroche managed the only hit when she legged out a ground ball to short with two out in the fourth. Eastern batted around in the first inning of the first game and scored four runs on two hits, two errors and two walks, and added three more runs in the fourth on two hits and three walks. Rathbun’s fourth home run of the year leading off the fifth ended the game, due to the eight-run rule. In the first game, Paterson and freshman shortstop Megan Godwin (Manchester) each had two hits and matched Rathbun with two RBI. Southern Maine hosts Bowdoin College on Wednesday (3:30 p.m.). The Warriors host the United States Coast Guard Academy on Tuesday (3:00 p.m.).